Blanchard Park recently hosted the third annual Orange Fiesta in the Park, a family-friendly event hosted by Orange County and the Hispanic Heritage Committee of Greater Orange County (HHCOGOC) celebrating Hispanic Heritage Month. Guests at the event enjoyed live music performances, Latin cuisine, games and Fiesta in the Park’s first-ever children’s soccer tournament. Amidst the fun, citizens had the opportunity to learn more about Orange County community partners and service agencies that were also present at information booths. 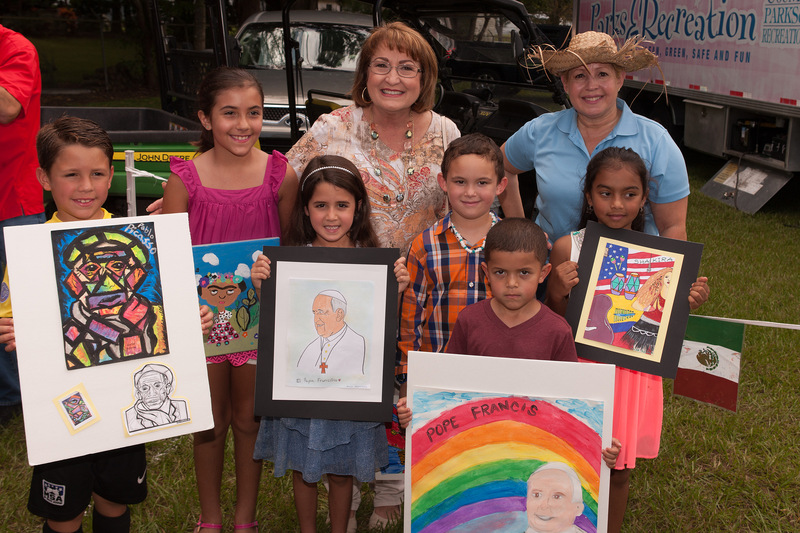 Orange County Mayor Teresa Jacobs provided a warm welcome and presented awards to the winners of the annual poster art contest and the children’s soccer tournament, which took place during the fiesta. Citizens also learned about pedestrian safety and Mayor Jacobs’ new Walk-Ride-Thrive! initiative. In addition to engineering changes on our roadways, Mayor Jacobs urged that increasing citizen mindfulness of their surroundings is crucial to increasing pedestrian safety throughout Orange County. Bike helmet fittings were also provided at Fiesta in the Park as well as information cards highlighting tips on how to remain safe while on the road – whether walking, cycling or driving. The HHCGOC was proud have an impressive turnout of more than 1,000 Orange County citizens and guests for yet another successful Fiesta in the Park. The Hispanic Heritage Committee of Greater Orange County is a volunteer-based organization founded with the purpose of providing opportunities that promote and highlight the contributions made by individuals of Hispanic descent in the community. All proceeds from food sales during Fiesta in the Park will go toward scholarships for Hispanic Students. This year, Orange County kicked off Hispanic Heritage Month, which runs from Sept. 15 through Oct. 15 annually, with a celebration at the Orange County Regional History Center on Sept. 9. The celebration included cultural dance performances, Hispanic food and the unveiling of special Hispanic artwork, which is on display at the History Center and the atrium of the Orange County Government Administration Center throughout the duration of Hispanic Heritage Month. Photos from Orange Fiesta in the Park may be found on Flickr for use by the media.